So, last Friday was a bit of a stressful day. 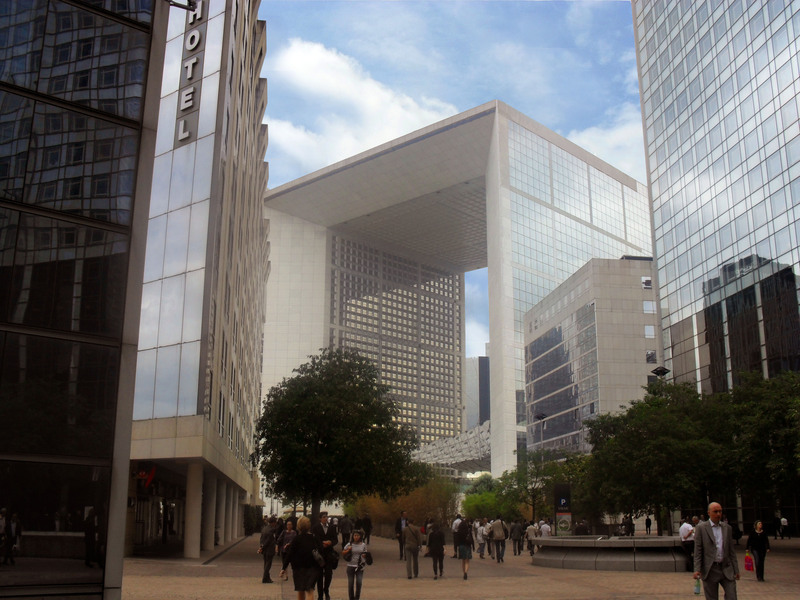 I had two new classes in the afternoon, both in areas that I didn’t know that well (Genvilliers and La Défense). My first class was at 12:00 and I knew that I was going to be late as I waited for the train. I had to get RER C, and RER C (overground train which goes to the suburbs) only runs every 15-20 minutes during the day. Having missed the last one by a couple of minutes, there was no way I’d be on time. However, having been told that if you’re less than 30mins late in France you are still considered to be on time, I assumed that 5mins or so wouldn’t damage my reputation too severely. At 12:05 I arrived at the right station, Les Grésillons. As I left the station, I started to worry – it was an industrial wasteland. Across the road was an empty factory with a barbed-wire fence. I turned left, and reached the right road after a couple of minutes. Across the road was another closed factory – number 279. I needed number 222. To the left of the factory, I could only see vacant blocks – squares of green grass, fenced-in rubbish, or abandoned housing projects. To the right, there was another factory. I turned right, and started to get anxious – there were no street numbers! The building went on and on – there were cars parked on the street, but I don’t know where their owners were as there were no sounds emerging from the factory’s broken windows. 12:15 – I walked on, still searching for street numbers, and hit the end of the road. I’d gone the wrong way! I did an about-face and powered-on in my suit and heels, determined not to lose any more time. I passed number 279, and marched past vacant block after vacant block until – finally – I saw an ‘Alliance’ building. The company I was looking for was called EOS ITS, but I figured that I could at least ask for directions here. I went through the gate and saw the number – 222. After apologising profusely to my student, Latifa, and offering to add an extra 10mins to our next three classes, we got to work. Latifa has the lowest level of my students, though you can’t actually tell it by talking to her. Her general conversation is very good, she can make herself understood very easily and I haven’t had to use French to explain anything. However, she has forgotten the alphabet and days of the week and many simple things – so she probably learnt English at school and hasn’t used it since. I’ve really enjoyed the last couple of lessons with her – although the topics we cover are very basic, I love going over the basic grammar. I love grammar in general – it’s the only time I really feel like I’m teaching anything. The rest of the time my students are just putting it into practice. I finished my class with Latifa at 2:10, to start compensating for the time I missed at the beginning of the lesson. As RATP told me it would only take 40mins to travel from Les Grésillons to La Défense, I figured I still had enough time to be early. However, I didn’t take into account that I might be stressed and my brain wouldn’t be working properly. Société Générale is one of my school’s biggest clients – we mainly work with companies in the financial sector, and this is one of them. This means that I can’t mess up. for the RER. But I didn’t panic – I figured I could just say I was stuck in reception. I hopped onto the train and looked at the map of the RER to confirm at which station I needed to change. Neuilly – Porte Maillot. Now, because my brain wasn’t in the best condition, I read the map as if I was travelling from a station called Porte de Clichy, instead of Les Grésillons. Because of this, when I hit the next station (Saint Ouen), I thought I was going in the wrong direction and bolted off the train and across the platform onto the train going in the opposite direction. As I walked through the doors, I asked a man whether the train was heading to Porte Maillot. He told me it was, and I sank into a seat, relieved. The man then approached me and gave me a bit of paper, saying that he and his children were starving and needed money for food, etc. He did a lap of the carriage then returned to me. I don’t usually hand out money (mainly because I don’t have any, but also because you see so many of these people on trains that your sympathy starts to wear thin), but I decided to give him a couple of Euros because he’d been so nice to give me directions. After I gave him the money, he told me that I was, in fact, on the wrong train. Apparently Porte Maillot was in the other direction! The train pulled into Les Grésillons and I went back to the platform where I had been waiting 10mins earlier. 2:40. Time to call my school. I called BTL and explained what had happened and they were surprisingly understanding – they offered to call my student for me and let her know I would be late. After another few minutes I hopped onto another train, and stayed on until I was supposed to get off. 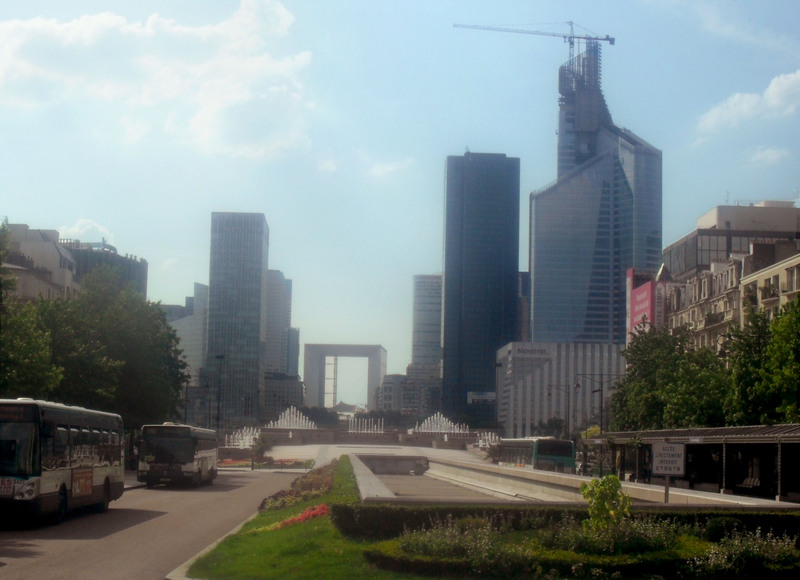 I then switched to the metro, and got off at La Défense – Grande Arche. Earlier that day I had been getting directions from the other teachers at school (it was one of the reasons I was late for my first class). They told me to take the exit of the shopping centre, and then explained how to get to the building. They didn’t tell me how to get through the shopping centre. Quatre Temps, the shopping centre at La Défense, is huge. I’m talking Chadstone big – probably larger. This means it doesn’t have one entrance/exit, and I didn’t know which one to take. I managed to get through it without much difficulty – and, although I didn’t choose the most convenient exit, I was able to orient myself once I was outside and easily found Soc Gén. I was only 30mins late. My student, Valérie, was lovely. She is having two lessons a week, so I see her on a Friday afternoon and Monday morning. She’s very attractive and has three daughters who she likes talking about – we did a lesson on brands and she loved telling me about not letting her daughters have branded clothes, etc., because she wanted to ‘keep them simple’ (i.e. : stop them from becoming vain). She loves going over grammar, and picks things up really quickly (I know – I’m easily won over), and she hates getting English phone calls. Valérie is an SP2 class, which means that 30-50% of the material in our lessons should be things she brings in from work. She has to host a meeting in English later in our course, so we’ll probably work on that then, but so far she hasn’t had many ideas about things we can work on. That was until yesterday – when I got to her office she was in a panic because one of her associates from Hong Kong called and she couldn’t understand his accent. She told me that she dreads getting phone calls in English and always avoids answering them, because she prefers to be able to listen to the message a couple of times and then email them back. As an example, she had saved a couple of messages for me, so it looks like we’ve found our SP2 work! After I saw Valérie on Monday, I met Xavier. From his test, I know that Xavier has a very good level of English. This is all I knew – I hadn’t been able to find any other information about what his job was or whether he had and previous courses and course books from BTL. So I prepared quite a long lesson, so there would be plenty of backup material. I needn’t have worried. Xavier’s course is another SP2 one. Having had classes with BTL before, he came in prepared with more material then I would go through in a week of classes. It turns out that Xavier is a financial lawyer (I know – holy crap). The material he brought in on Monday was for a meeting he had on Wednesday in Brussels with the European Payments Council (EPC). Apparently the EPC is having an argument with the European Commission about something to do with mandatory payment dates – from what I gathered, the EPC thinks mandatory dates are necessary, but the European Commission (EC) doesn’t want to enforce them due to the extra regulation this would entail. So, after about 40mins of learning about this and what France’s position is, and what his role in the scenario is, I wondered what to do with all of the documents he’d brought in. There were hundreds of pages of contracts and legal correspondence that were on the agenda for Wednesday’s meeting – there was no way we were going to get through much of it in one lesson. But he also needed to do some work on it before his meeting. I asked him which document was the most important – it was a summary of the European Commission’s position. I asked him to read it to me and summarise it to me. We then went through some vocab that he didn’t understand (there was one I couldn’t help him with – some sort of bank account. I told him what the word he didn’t know meant, but I had no idea what it was in relation to finance), and argued about the EC’s arguments. I took the EC’s side (pretty easy, as the points were written for me), and he had to argue with me and explain why the mandatory dates were a good thing. I’m not sure how much he learned, but I thought it was useful to get him thinking about it some more before the meeting. Tuesday and Wednesday went as per usual – I’ve had those students since the beginning. On Thursday, my morning class was cancelled. Although this was logical (one student was going to be away for four weeks, and the other was going to be away for the next three), it means that my only income for that slot over the next month will be if I get some replacement classes. 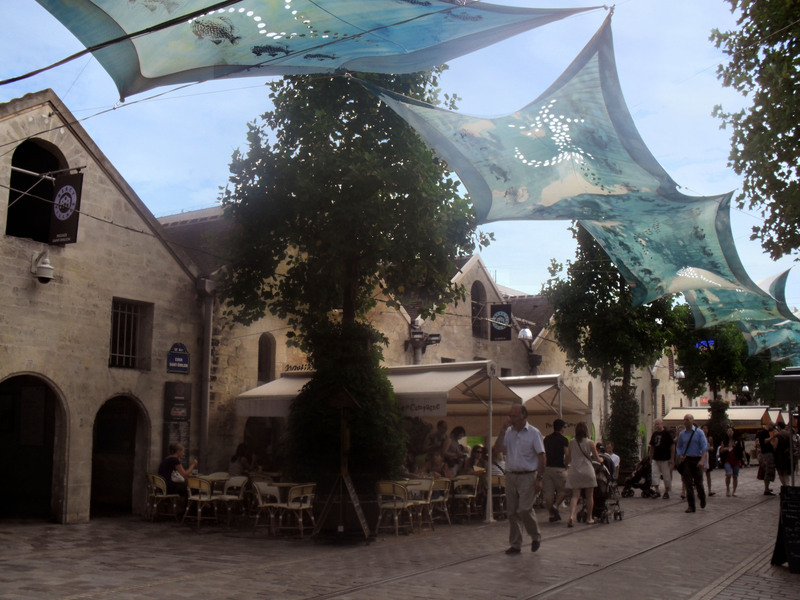 It’s a shame, because I really liked the area that class was in – it’s like a small village in the middle of Paris. Bercy Village is a group of 19th century wine warehouses that have been converted into specialty shops and cafes, and the neighbouring park, Parc de Bercy, is beautiful with a rose garden, trellises covered with vines and a number of water features. Luckily my Thursday afternoon classes are only one stop away, so I can easily wander around. Marie-Maud was another very advanced student. The most advanced of all of my students, I was worried that none of the books would be challenging enough, and that she’d spend our lessons bored. Again, it seems I was worrying for nothing. Although advanced, Marie-Maud was lovely. Being in her late 20s, we had a lot to talk about and laughed quite a bit, and she enjoyed doing idioms. She said her priority was to go practice her grammar (no wonder I like her), especially her tenses, though I didn’t notice her make any mistakes. This seems to be a common concern for many of my students – they want to do a lot of grammar revision, and they want me to correct their mistakes. This is all very well and good, but it borders on being paranoid, as they don’t actually make that many mistakes. All in all, things are going well. Because many of my students are going on holidays over the summer, I have a number of replacement classes coming up over the next few weeks – I’m a bit nervous, as I seem to prepare better lessons once I know my students, but it’s all a learning experience! I loathe waking up. That’s probably not the most optimistic beginning, but I never want to get out of bed in the morning. I cling to my doona until the last possible minute then grumble through my morning routine with a passion that I never had at home. Once I’ve been on the metro for a few minutes and my day is officially unrolling, I perk up. I usually have a seat (I’m assuming this is because it’s summer and most of Paris is on holidays on the coast) and read. Between the metro and my classes I pull out the appropriate dossier for the class, so I can show the receptionist my students’ names in case she can’t decipher my accent (this happens frequently). I usually wait in reception for one of my students to collect me, and during that time I go over my lesson plan. After three weeks of teaching my plans have shrunk dramatically – originally I wrote over a page of dot-points on activities with discussion questions and estimates for how much time each exercise would take. Today my lessons had single paragraph plans. As long as I have spare material on me and know what I want to cover from the course book, I figure I’ll be fine. Last week my main concern was that I wouldn’t have enough work – on my first week I worked 11.5 hours. On my second I worked 4.5 (Bastille Day cost me 5 hours). 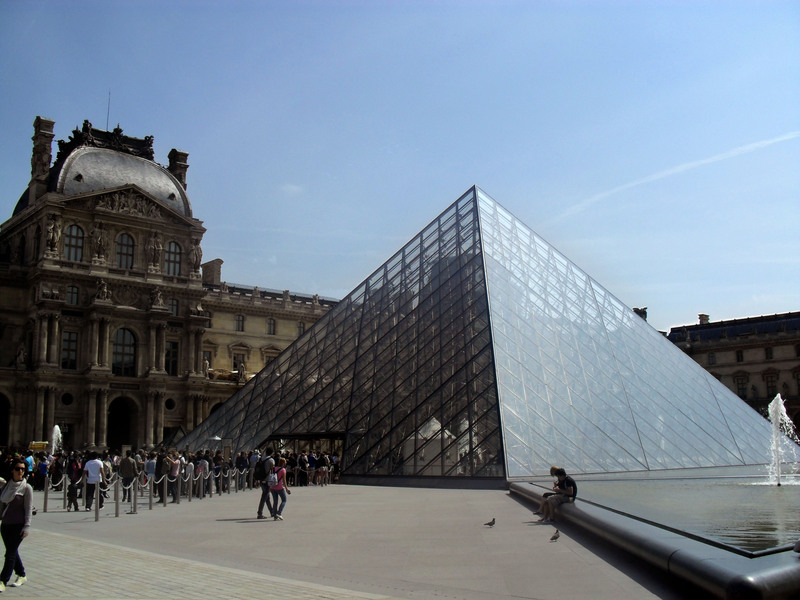 Being on an hourly rate, I knew that if this continued I wouldn’t be able to afford to stay in Paris. My calendar for next week is below. Look how it’s grown! Grey and purple appointments are regular classes (grey is SP1 – meaning general business English, purple is SP2 – meaning general business English plus English documents that the student provides from his/her work environment). Blue are replacement classes or intensives (replacements are when other teachers are on holidays and intensives are 30-hour courses that students do over a week at my school’s office – if I get one of these it’s usually only one of their morning or afternoon classes, not the whole week). Green appointments are to be confirmed. As each course is from 10 to 20 hours, this means I have guaranteed work for the next couple of months! This is by far my favourite class. Having an upper intermediate level, they are very good at getting into debates and making jokes in English – we always end up laughing at some point. It also means I get to bring in newspaper articles and other supplementary material that’s too advanced for some of my other students. There are three students – Charlotte, Anne-Francoise and Olivier. Olivier is the most advanced of the three – while the ladies are reading he goes onto the reading comprehension activities. When I brought in the news articles, he chose an opinion piece on the Russian spy story – I think many native English speakers would have struggled to summarise it accurately, but he did a brilliant job and managed to condense the contention into a couple of sentences. I worry that I don’t have enough challenging material for him, but he never complains. He sometimes seems like a school boy seeking approval. Charlotte and Anne-Francoise are at a slightly lower level. Although Anne can keep up, she does take a bit longer to read and I worry about leaving her behind. Both of the ladies are tan with short blond hair, though there is about a 15-year age difference between them. We have had three lessons so far, and they have been late to all of them (actually, I was late to the first one, so I can’t really blame them) – on the second week they both forgot that they had class, and on the third week Anne happened to get to work while I was waiting for Olivier to collect me from reception. She dropped me off in our regular meeting room then left to get a coffee and returned 10mins later. Sandra detests the course book. On our second week it was just the chapter (Companies), but this week she announced that she hated the book and slammed it on the desk. Sandra has a beautifully coiffed Posh-Spice bob (sorry, I don’t remember the name of it) and always wears beautiful heels with skinny jeans and a top that shows off her cleavage. She has a pre-intermediate level of English, so she can converse quite well but has a limited vocabulary and pauses frequently. And she doesn’t like business English. As she doesn’t really use English at work, I’m going to try a travel-focussed lesson next week. This class has two students – Florence and Samya. In the last three weeks I have had two lessons with Samya and one with Florence – I have yet to see them in class together. My first lesson with Samya was really good – although she was the same level as Sandra, her oral expression was much more fluent and she rarely had long pauses. She also was like a sponge with grammar – accepting whatever I said then putting it into practice. At least, that’s what she was like on the first week. Last week she had just come back from a week on the beach (she was so brown I looked anaemic) and her head was in the clouds. She was nowhere near as talkative and her English was littered with French phrases – I hope she’s back in the mood for work next week. Florence was interesting. She was lovely, but a bit shy and I think she approached tears of frustration at one point when she couldn’t answer my questions (I’m not a mean teacher – I promise! I felt awful). I hope she’ll be a bit more comfortable when she’s in the lesson with Samya. 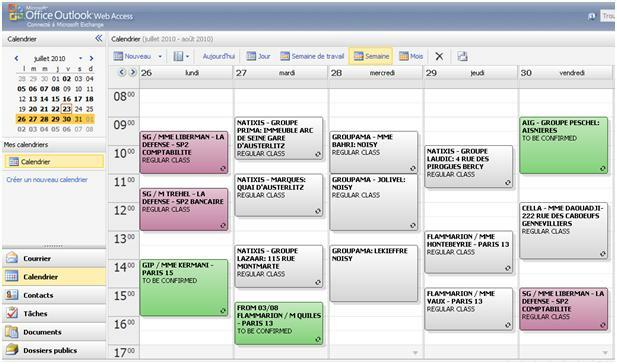 All of my Tuesday classes are in Natixis offices (Natixis is a bank) – in a week I have four different Natixis classes in four different offices. The company is huge! My Wednesday classes are in Noisy-le-Grand, which is in zone 4. This means I have to take RER A to the suburbs in peak hour – not fun. Joelle has an intermediate and loves to joke and talk. She told me that she likes doing written exercises but would prefer to do them at home and spend our class time talking. However, having seen her homework last week, I’ve realised that her speaking level is higher than her written and grammatical level, so she might not get her wish. She’s a bit difficult with regular classes. Admittedly, it is summer and people go on holidays, but she is going on two separate holidays, as well as missing a week for a doctor’s appointment and missing two weeks for work seminars – she’s missing seven weeks! I’m trying to reschedule them, but two weeks after her course ends she goes on holiday again! I’m not sure she will improve as much as she wants to. Bruno has a low pre-intermediate level. Although he’s friendly and likes to talk, he often doesn’t realise that I’ve asked him a questions. His listening skills need work (not just because he has trouble understanding me sometimes, but listening activities take us a long time), and he used Google translator for his homework. We also had some issues with ‘how’ questions in his first class. However, I think we had a breakthrough this week! I got him to answer the five w’s and how about a story he’d read in the news, and then did a worksheet and had him ask me questions – I think he gets it, but the true test will be how he goes on his homework, which is answering the questions about another article. This guy really reminds me of a young Daniel Auteuil (see the picture). I don’t know what it is. But he really likes to talk. I mean really. In our first lesson, he spent an hour talking. He could have happily spent the whole 90mins talking, but I managed to twist what he was saying so it was related to the exercises I was doing. But I don’t think he really wants to do much work – he’s working on a thesis at the moment and also has a full-time job and four children, so I think English class is like a bit of a rest for him. He has done courses through my school before, and when I asked him what worked and didn’t work for him, he told me he liked the first teacher because they talked a lot and had coffee. He didn’t like the second teacher who was very academic and used the book. Hmm . . . I want there to be some sort of structure to our lessons, but I also want him to like me. I ended up bringing in one of the News Lessons from the One-Stop-English website last week and he really seemed to enjoy it, so I’ll probably do more of that. Thursday’s classes are in the 13th arrondissement, which I don’t think I’ve visited before. When I leave the metro I already know I’ll like working near here – there’s a park on one side of the metro and on the other there is a stone passageway that cuts through an arcade of cafés and gourmet shops – the feel is very similar to the Prahran market. And it’s so quiet as I walk down the paved pedestrian road towards the Seine. I get to this office 10mins early and ask the gentleman at reception to call Daniel, one of my students. At 10:10, I return to the desk and he says that he couldn’t reach him. I ask him to try Antoine (my other student) as well. At 10:15 I call the office and tell them my situation – if the class doesn’t go ahead then I get paid anyway because the students didn’t cancel 48 hours in advance, but I need to wait here for half the length of the lesson before I can leave. Lisa (a lovely English girl who works in the planning department at BTL and has perfect French) says she’ll send the students an email. At 10:30 Antoine collects me, saying no one called him. I ask the gentleman at reception if he tried calling Antoine, but apparently he only called Daniel who is in a meeting. Antoine is lovely and polite – he worked in aeronautical engineering before moving to banking. He explained why he switched industries (he needed a change), but I don’t really understand why – aeronautical engineering sounds cool! The lesson goes smoothly, but it turns out that Daniel will be away for the next three weeks, and then Antoine will go away for four weeks after that. This means that they will both miss a fair chunk of their 20 hour courses, and spend less than half of their lessons learning together. At the moment this course is back with the planning department, who will determine whether it should continue like this, or whether we should postpone it until September. This is the first lesson I have outside of the financial sector – Flammarion is a publishing company, so I’m immediately interested. Muriel is lovely. Her English tested lower than Bruno’s, but she seems to be much more adept than him at the exercises I set. What is interesting is that she is perfectly capable of having a conversation, but she has forgotten a lot of her basics – we ended up revising her numbers as well as her parts of speech. She picks things up quickly, though, so I think she’ll be okay with a pre-intermediate book, as long as I continue doing elementary grammar as a supplement. I’m really surprised at how good I feel when I get out of our first lesson – she seemed so quiet and shy when she first approached me, and when the lesson started I was worried about it being strained and awkward. But by the end she has loosened up so much that I can’t help but feel buoyant. I’m surprised by how much I enjoy teaching here – this was never a career plan for me, it was just a job I could do that would allow me to travel. But I do enjoy it – I love seeing the different parts of Paris and meeting different people, I like learning what students are interested in and tailoring lessons that they’ll (hopefully) enjoy, and I love that I’m making a difference, even if it is small. I have a bank account!!! I have a bank account! Some of you may be questioning my excitement – surely three exclamation points in the title is a bit extravagant for something as mundane as a bank account? Not so – after all of the effort it took to open an account, I’m not sure that even three exclamation points can accurately represent my triumph. Before I left Australia, I Googled ‘opening a bank account in France’. Several sources told me I would just need my carte de sejour or visa, along with my proof of address, so a utilities bill or a rental contract. Apparently that wasn’t good enough. She told me that I needed a long list of things, the only one of which I understood was ‘electricity bill’. She also said I’d have better luck if I tried a bank closer to my address. Scratch LCL off the list. A few days later I went to a HSBC branch near my flat. Within a few minutes I was in an office with a staff member – this was already more promising than LCL. I was asked where I lived, how long I would be in France, whether I had a HSBC account in Australia (no), whether I had any money (no), and whether I had work yet (at that stage, no). Unfortunately I would not be able to open an account without a work contract. I waited until I’d signed my teaching contract before trying again. After I signed my contract, my employer recommended BNP Paribas, as it was the bank the school used and they were used to people heading straight over there with their contracts to open accounts. I headed to the closest BNP branch and was taken to the director’s office (apparently everyone else was away or busy). She asked for my employment contract, then asked for my proof of address. I handed her the rental contract. She sighed and said that they couldn’t do anything for me until I found a permanent address. I protested, saying that I couldn’t get paid without a bank account, and she said there was nothing she could do. She could make an exception if I knew someone with a permanent address who would be willing to receive my mail but, having only been in Paris for two weeks, I knew no one. After complaining about my predicament in the teachers’ lounge at work, I was introduced to Mary-Louise – another teacher; and an Australian who had managed to open a bank account in Paris! She recommended the Banque Populaire (BRED), and said they had been really helpful. Regarding the address, the other teachers said I would have to get an electricity bill from my landlord with a letter saying that I lived at that address, as well as a copy of his/her National Identity Card or passport. As my current landlord was in Russia, I would have to wait until I found my next room. Jordane, the girl who pays the bills in my current flat, was very helpful and wrote a note on a photocopied bill saying that I lived there. The next day I went to the BRED with my documents and said that I would like to open an account. They booked an appointment for me later in the week, and I showed them my documents (my passport and visa, the electricity bill, a copy of Jordane’s passport, and my employment contract) to confirm that I had everything I needed. They said everything was fine, and I eagerly awaited my Thursday appointment. On Thursday I was taken into an office and the woman started filling out my paper work on her computer. Then there was a problem. The number on my visa was the wrong length for her computer form. She called someone, who didn’t appear to be able to help. She explained the problem to me, saying it was impossible for her to complete the online form with this number, and asked if I had a carte de sejour. No, I didn’t, because my 12-month visa has a note on it saying it can be used as a temporary carte de sejour! She said I might have luck at another bank, but I couldn’t open an account here. Scratch BRED off the list. 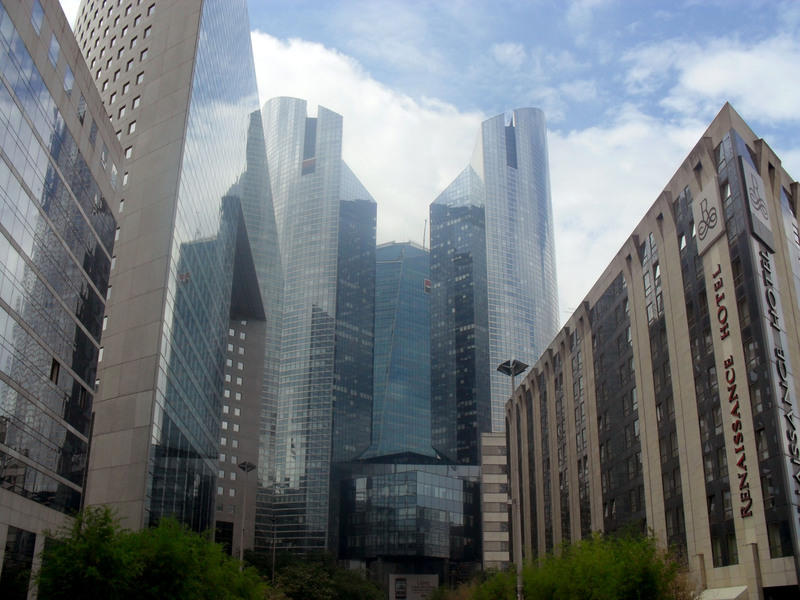 On Monday I returned to BNP Paribas with all of my documents. I was taken to see a different person this time, who looked through my documents and took the relevant copies. “Everything is excellent,” he said, “but I need one more thing.” He handed me a form that read ‘Attestation d’Hebergement’. I needed to get Jordane, whose name was on the electricity bill, to complete the form saying that I lived there (all of the details were covered in the letter she wrote, so I’m not sure what the problem was). Hmm – an impasse. Would I have to try another bank? “Could your employer write an attestation?” he asked. “Okay – they need to write a letter attesting that you work there, and that you live in the 18th arrondissement at Mademoiselle Pineau’s place,” he kindly wrote instructions for me. We made an appointment for Thursday, and I headed back to the office to get a letter written on the official stationery. I returned to BNP Paribas yesterday. I arrived at 8:50, early for my 9:00 appointment. As the bank didn’t open until 9, I waited inside next to the ATMs. I could see a couple of women inside through the roller doors but, as the clock ticked closer to 9, they remained closed. At 9:01 I started to get annoyed – why hadn’t the man booked an appointment with me half-an-hour later if the bank usually opened late? The two women inside kept running back and forth from some sort of control panel next to the side door – apparently there was a problem. I’m not sure what it was, as they neglected to tell their waiting customers (customer service – French style). This continued until 9:15, at which point all of the staff members (who had been waiting outside) were called in. I had my 9:00 appointment at 9:20. The guy ended up being so flustered that he barely glanced at my Attestation from work – he just saved it for his files and then gave me a million papers to sign. Most f them I understood, but one had someting to do with €750 over a three-month period – don’t ask me what the €750 were for or where they came from. I’m only getting a debit card, so I don’t think it would be a limit. Maybe my overdraft amount? I hope I don’t need to pay it – I haven’t even earned that much yet. I told him I didn’t understand, so he gave me examples with different euro amounts – 800, 900, etc. – and divided them over three months. I was fine with the maths, I just had no idea what this money was for. In the end he said it wasn’t important and had me sign another bit of paper. I left with a booklet as well as a copy of everything I signed, so I might go through it with a French-English dictionary and see what he meant. So I now have a bank account! I have officially given my payment details to my employer and (after I follow some instructions in a letter to confirm my address – because the electricity bill, letter from Jordane and letter from my employer weren’t enough) I’ll soon have a debit card! For those of you who are looking at coming for France – don’t believe the websites! You can’t get an account with a visa and a rental contract. Living in France is much harder than I expected it would be. I was pretty cocky when I came over – I reasoned that since I’d already gone to London on my own, not knowing anyone and with no room or job, Paris would be just as simple. 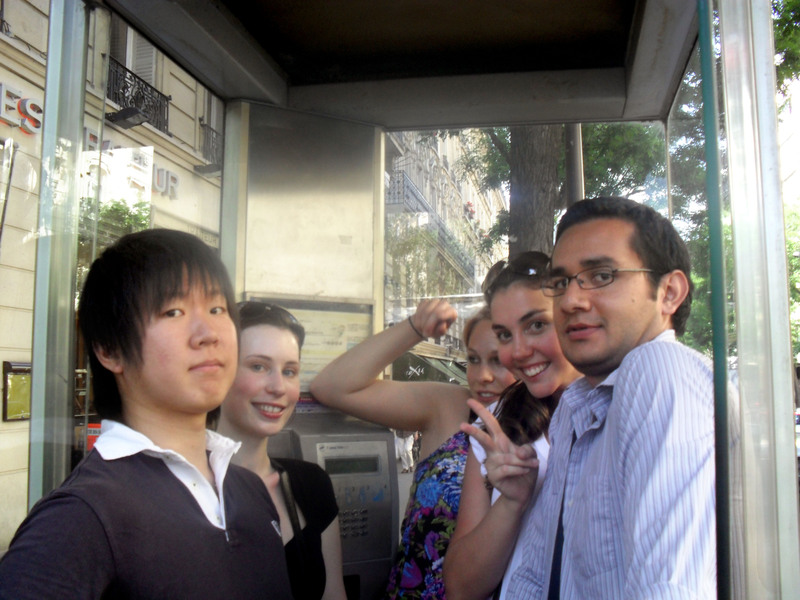 Sure, there was the language barrier, but I’d always had an awesome time when travelling in France and I expected that I’d be fluent enough to be building friendships after a couple of months. It hasn’t quite worked out that way. For the sake of being honest and not glossing over the low points of my trip, I might as well admit it – I’m lonely. It comes and goes, and with so many posts being dedicated to the admin of starting a new life, I haven’t had much of a chance to write about this part of the experience. When I’m busy it’s fine – my first week here was fine. The week I was at language school was fine. Unfortunately I can’t really afford to go back to language school until I start getting paid. It’s also difficult to start travelling on my weekends for the same reason. I’ve already been to Paris twice so I don’t really feel like visiting the tourist sites again. I have a room until the end of August, so I’m not frantically looking for somewhere to sleep. And my teaching hours are still building up, which leaves me with a lot of time to myself (I’m actually in a pretty good mood today because I just had 4.5 hours of classes and might be going out tonight, but today is the first time I’ve had work since last Wednesday). I’m generally fine with a couple of hours of nothing, maybe even a day, but then I realise that I have nothing planned for a few days and I get lonely. And there’s only a certain amount of blogging and Skype-ing I can do each week before people get sick of it. London wasn’t like this. In all honesty, I was there for four or five months before I started making my strongest London friendships, but in the meantime I was okay. I called home once a week; I had housemates who I liked to hang out with, even if this didn’t result in lasting friendships; and I tried internet dating out, which kept me very busy. Did I get lonely? Yes. But it didn’t happen for a couple of months. Here it has been coming in waves since my second week. Here my current housemates speak French and, although they’re nice people, it’s difficult to have a real conversation. The teachers at work are all sent to different businesses for classes, which means there’s never a regular group of us that hangs out in the teachers’ lounge. Being in Paris is an effort. Talking (which I’ve always been very good at) is difficult. Shopping is difficult. Some supermarkets expect you to weigh your fruit and veggies before you get to the cash register, and others don’t. The notebooks here all seem to have graph paper instead of horizontal lines. There are a ridiculous number of pharmacies yet I can never find what I’m looking for (Nurofen). And yesterday I burned my suit pants when ironing (my iron back home never got that hot!). Although this can be very entertaining, it makes it very difficult to relax. It leaves you feeling vulnerable – at low points it’s like you’re always steeling yourself against an attack. That being said, you generally aren’t allowed to complain because you’re in Paris. And you should just be grateful to have such an opportunity. I am grateful. It doesn’t change the fact that it is lonely, and I’m looking forward to finding my place. I’d already done two two-hour intensive classes at my school, but intensives are planned by someone else so they don’t really count as real teaching. So the pressure was still on when I had to do my first in-company classes. RATP (the Parisian public transport website) told me that I would need to leave at 8:15am to get to my 9am class on time. Wanting to give myself a bit of breathing room, I left at 7:55am. If you look at a map of the Paris metro, the south-west end of Line 10 (the Boulogne end) breaks off into two parts, and joins up again for the last two stops. I originally thought that alternate trains took each route. Not so – trains going east take one branch, and trains going west take the other. I needed to change from Line 9 to Line 10 at Michel-Ange-Molitor, which is closed for renovations until July 27. However, as Line 9 also connects with Line 10 at the next station – Michel-Ange-Auteil – I assumed I would be able to change there instead. Not so – Michel-Ange-Auteil was on the wrong branch. I walked around the station for several minutes trying to figure out how to get to Gare D’Austerlitz, then realised that I would have to head back to Boulogne (basically going back the way I came for three or four stops), change there, and get a new train into the city. Not to worry – I’d left early, so with this hiccup I should still have had enough time to get to the office by 9. I reached Gare D’Austerlitz with 12 minutes to spare (according to the website, it would take 9 minutes to walk from the station). And I couldn’t find the exit I wanted. I could find the other four of the five exits, but not Quai D’Austerlitz (where the office was). I stayed calm. I looked at the map of the area and figured out how to get there from another exit. Boulevard l’Hopital intersected with Quai D’Austerlitz, so I took Boulevard l’Hopital and turned left when I hit the river . . . the street sign said Quai Saint Bernard. I’d turned the wrong way. I quickly went back across the road I’d just crossed and was on the right place – Quai D’Austerlitz. I didn’t have enough guts to check the time. I walked as fast as I could in my skirt and heels to number 47 and told reception that I had a class starting at 9. She looked for the names on her computer and couldn’t find them. I handed her some of my paperwork with my details. “Oh, I’m sorry Madame, you’re at the wrong address,” she pointed to the address on my paper. What?! Oh my God, I was already running late. Luckily the right address was in a street behind Quai D’Austerlitz, so it only took a couple of minutes to get there. I went through the same routine with this receptionist (the clock on the wall said 9:10) and she said she’d call someone to get me. At 9:15 that someone came and, nearly twenty minutes late, the class was underway. This was my first of three classes for the day (don’t worry – for the others I was a model of punctuality). The first one was great – the three students (two women and a man, two in their late thirties and one in her late forties) had an upper-intermediate level, so we got to joke around a bit and had a few laughs while still getting everything done. We did a unit on presentations, and there was an activity (not mine – from the book) where each one had to persuade the rest of us to buy a washing machine/dishwasher/coffee machine with our fictional social club’s money – I ended up pitting them against each other by getting them to argue why their product was better than the other ones, and watching the debates unfold was very entertaining. My next class (which was at 47 Quai D’Austerlitz – I didn’t just make up the address) was with one girl who was pre-intermediate. Having only had classes with intermediate and upper-intermediate students, I was surprised at how much of a drop there was in her fluency. I think a lot of it is a practice issue, but I realised that I need to improve my vocab definitions (I have a habit of explaining words with more difficult words). She was also fun, but it was more difficult to figure out what interested her, and to figure out how to make the topics relevant to her. My third and final class of the day was with two pre-intermediate girls, though only one showed up. She was lovely, and very receptive to grammatical concepts – we did some work on modal verbs and I was just able to give her some simple rules, and she accepted them, no questions asked. She then did the activities using the rules – after one of my intensive classes it was a bit of a relief, she just followed the rules and accepted that they worked, and didn’t really care about why. Unfortunately in this class I hadn’t copied the right audio files, so half of my lesson plan was gone, but I had a number of other activities on hand that I could use. However, this didn’t result in my most dynamic lesson of the day, and at 2:20 I was debating whether or not to give her some more work, or just finish a bit early. The first lesson went from 9 to 10:30, the second from 11 to 12:30. The third started at 1:30. At 2:25 we’d finished talking and I said that I could give her another activity, or we could finish five minutes early. We decided to finish five minutes early, and it was only after I had left the building and was on my way to the metro that I remembered it was a 90 minute lesson and I’d finished it 35 minutes early. I know – my bad. 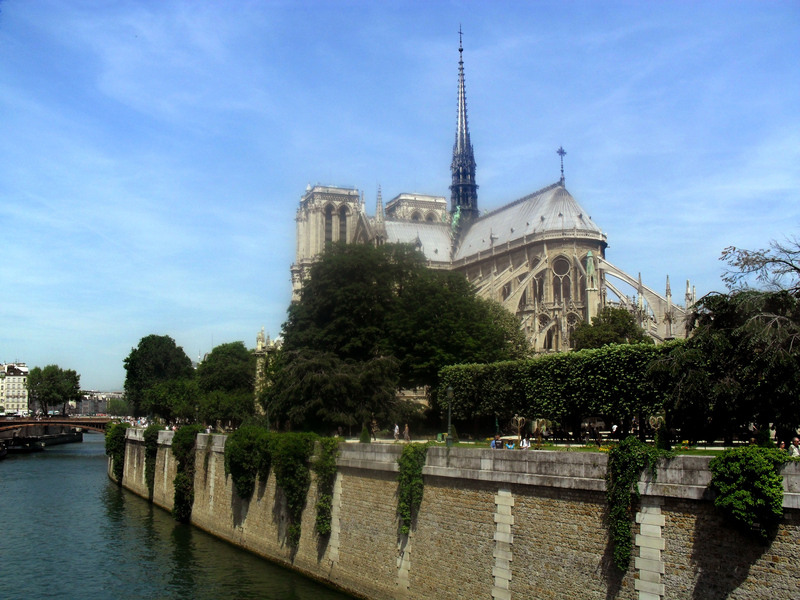 I thought about going back, then decided against it – 10 minutes had already passed, which meant that by the time I returned and we’d settled back down there would only be 10 minutes left (the real reason was that I didn’t want to look stupid in Paris and chickened out). So I went to my school’s office to prepare tomorrow’s lessons, and spent two and a half hours hanging out with other teachers in the teachers’ lounge – more importantly, I spent two and a half hours speaking English with fluent English speakers! With my second at interview at BTL scheduled for Monday June 28, I didn’t think I’d be starting work until the following week. Hence I decided to enrol in French language classes. Although I’m speaking a little more than I was at the beginning, I’m astounded by how much I’ve forgotten, and think the refresher will be useful. I arrive at Ecole France Langue at 8am for my entrance test, which will determine what level I am. The test gets progressively harder, and while I’m confident at the beginning, that confidence soon deteriorates as I stop knowing and start guessing the answers to questions. When I’m finished, a man takes me to another room to have a chat in French and to correct my test. I only said about 5 words, but I think my accent being fairly decent and my comprehension led him to believe that my level of fluency is higher than it actually is. Then he attacked my test with his red pen. I breathed a sigh of relief as he started doing little ticks – tick, tick, tick – suddenly, a big red cross! And another. And more! Some of the questions I hadn’t read correctly and had to answer them verbally (and passed with flying colours), but by the end of the massacre my test was a mess of red ink. Really? I thought. You’re not the only one. Apparently I demonstrated knowledge of a number of advanced parts of the language, but I also made a lot of elementary mistakes. This meant that he didn’t know what level to put me in. I left him to the decision, and somehow I ended up in level B2 (upper-intermediate), which I think is a level higher than I was last time. Don’t ask me how I’ve progressed, not having spoken nor read any French in years. Learning a foreign language as an adult is like going to school as a child again. Not only does your ability to communicate drop to that of a primary school student, but there’s a larger focus on games as a method of learning. As an adult, you get used to receiving lectures and taking notes. When learning a language, you are expected to speak more than the teacher does, and games are a good way to ensure this. For example, when I arrived on the Wednesday our class had been put into the same room as another. A woman then told us we were going on ‘missions’ – there were six stages we would have to complete over the next three hours, each of which would involve us having to ask people in the streets for help so we could answer questions or take photos of certain things. For our first stage, my team and I had a sheet of paper with eight photos on it, which we had to replicate, as well as going to one of the school’s other offices and taking a photo of someone who worked there. Now, I’m all for winning, but it was a hot day and I was in a skirt. And it was just a class activity – it’s not like there were any prizes (go on – ridicule me for being soulless and for having forgotten how to be childlike). 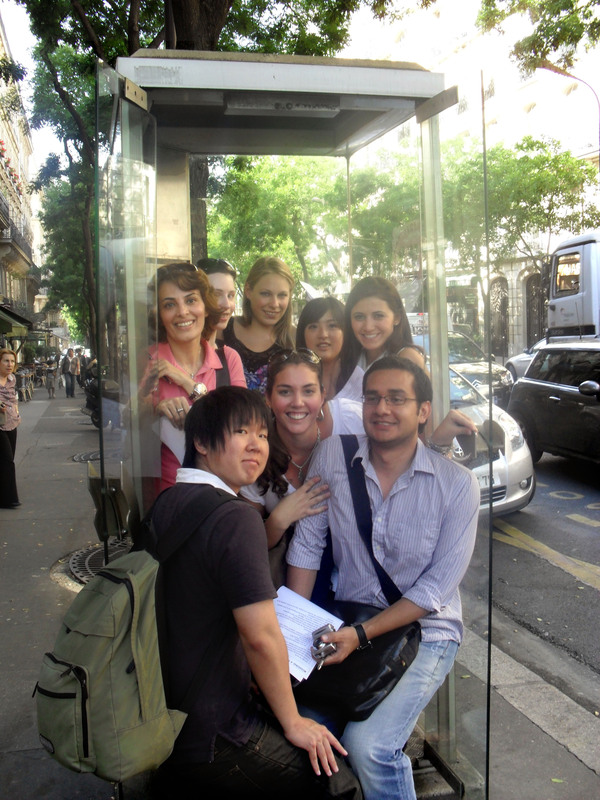 Other challenges included finding a museum and getting photos there, fitting as many students as we could into a phone booth (see the photos – entertaining, but very sweaty), taking a photo with a child, getting the brochure from a chocolate shop and matching shop names to pictures of products that they sold. It was fun, but it was in the low 30s and most of us had tired of the activity before the three hours were up. The ability to communicate (or lack thereof) is the other childlike aspect to learning a foreign language as an adult. Grown men and women start to act like eight-year-olds, being attached to their ideas, but not knowing how to express them. I did a month of language school in Vichy at the end of 2006, and I grew incredibly distressed when I couldn’t say what I wanted (one time I was close to tears). This time I’m more detached, which makes it more amusing to watch other people get increasingly passionate about little things. There were two girls in my class in particular – one of them clearly felt very strongly about a number of issues, but because she couldn’t say everything she wanted to, her volume would just increase and her gestures would get bigger as her monologues continued. The other would get extraordinarily attached to grammatical structures, or he said/she said debates, and because she couldn’t use many words she would just keep repeating the same couple of statements – it didn’t seem to matter how many times the teacher said he knew, she would keep saying the same thing until she realised she was just saying the same thing. Do I think the week at school helped my French? Yes, in the sense that it got me speaking again. However, I don’t think I was there long enough for it to stick, and the fact that I speak English at work means it will be a while before I start having in-depth conversations in everyday life.